Our Texas certified appraisers are the leading providers of independent residential and commercial real estate appraisals in the La Porte market area. We strive to provide an appraisal service that exceeds our clients expectations and is delivered with an industry leading turn time. Our appraisal fees are highly competitive and we take pride in maintaining some of the fastest report turn times in the area. Getting started is simple! 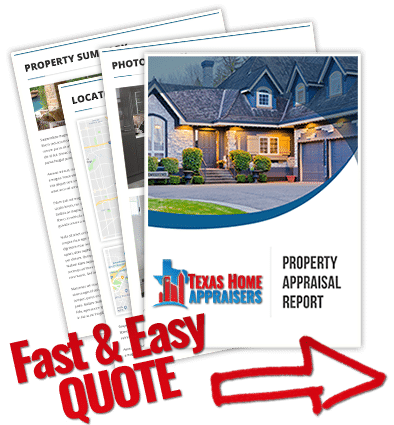 Simply submit the web quote request form or phone the office and one of our independent real estate appraisers in Houston TX will be more than willing to discuss your assignment. I found my home value online through a website. Can an appraiser use that? Not only can appraisers not use those sites, they are also a poor source of reliable data. Instead, appraisers mainly rely on the local MLS to find reliable sales and listing data. If a sale took place off the MLS, but is verifiable through reliable means, the appraiser can use that as well. Because of the inaccuracy and misleading data provided by online valuation sites, appraisers usually do not recommend anyone use them for anything other than ballpark numbers. A better way to determine a ballpark value for a home is to search your local MLS and look for comparable homes in the same area that are pending or active. What does the term market value mean in an appraisal? Fair market value, as it is often called is the most probably price a property will sell for in a competitive and open market with both parties being knowledgeable of the property and transaction details. The FNMA URAR 1004, commonly associated with “Fannie Mae” loans, has additional reporting requirements that have more significance for the lending process than with the actual dollar market value. Both primarily rely on a direct sales comparison or market approach with a comparison grid to determine the market value of the subject property. The lenders report has many additional arbitrary requirements which have little bearing on the value found by a report needed for many other purposes. An example of this extra data would be census and SMSA information which is strictly for lender’s internal tracking of loans. The general purpose forms we provide to private clients will satisfy any appraisal use and are very easy to read and understand. What is the definition of an arms length transaction? The definition of arm’s length is a transaction in which both parties are independent and have equal knowledge about the transaction.